My family adores all the flavors involved in Asian foods- soy sauce, rice wine vinegar, sesame oil, cilantro, garlic, ginger. Boy boy, my mouth is watering now just typing this out!!!! This recipe involves all those flavors and is really VERY delicious!! The original recipe is from Ina Garten but, as usual, I had to change things up a bit. Feel free to play with it, too, to create something your family will love as well. For the dressing, whisk together the vegetable oil, rice wine vinegar, soy sauce, sesame oil, honey, garlic, ginger and peanut butter in a medium bowl. 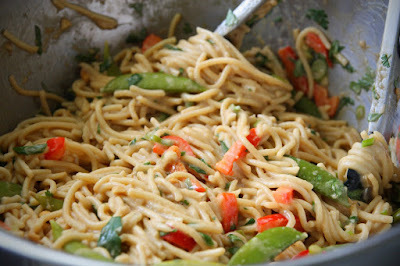 Combine the spaghetti, sugar snap peas, peppers and scallions in a large bowl. Pour the dressing over the spaghetti mixture. Add the chopped peanuts and cilantro. Delicious warm or cold. You always have such great recipes! Thanks for sharing. Seriously, I just ate lunch and now I'm hungry just reading the recipe. I love any kind of Asian flavored salad. Oh, my friend, this looks delish! Can't wait to try it! It's been such a busy few months for our family, I can't remember if I shared our miraculous news with you. Check out my blog when you get a minute. God is so good! I think we'll have stir fry this week.